The Color Charge Plus™ utilises the very latest generation of LED and optics, resulting in 50% more output (900 lumens) than the original Color Charge™ (600 lumens) from the same size unit. The Color Charge Plus™ fixture's environmentally friendly design includes a recyclable long life battery cell and an interchangeable LED head for upgrading in the future. The highly efficient nickel-metal hydride (NiMH) power cell delivers up to 30 hours usage from a single charge and provides up to 1,000 charges; approximately double the life of lead-acid batteries. The fixture also features a built-in mains charger that enables it to continue to be used while charging, and a gas gauge showing the percentage and hours of usage remaining. 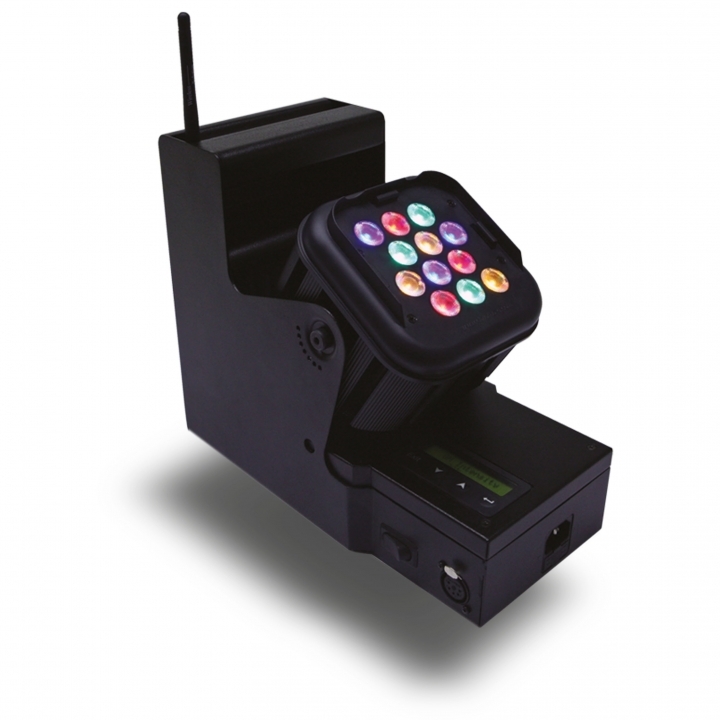 The Color Charge Plus™ features Wireless Solutions wireless DMX control and syncing between units, allowing connection of up to 170 fixtures on a single network. With a wireless range of 100m in a crowded room and 200m with a clear line of site, the Color Charge Plus™ is ideal for large indoor spaces. Also, the unit's wireless aerial folds away discreetly for convenient transportation. Part of the new generation of Chroma-Q® LED lighting models, the Color Charge Plus utilises unique colour mixing and control management technologies providing a high quality light output. The Chroma-Q® RGBA engine has been developed to deliver an incredible CRI of 92, for true colour balance across the spectrum and accurate tungsten white light emulation. The fixture utilises unique ColorSure™ technology for enhanced colour consistency across fixtures. The unit also features smooth, theatrical grade dimming, making it suitable for a wide range of temporary entertainment and architectural lighting applications. The Color Charge Plus™ can be floor mounted or hung from truss via 1/2" nutsert and safely secured in place via a built-in Kensington lock slot. For maximum practicality, the Color Charge Plus™ can also be mains powered and controlled via wired DMX. 140mm x 230mm x 280mm / 5.5" x 9" x 11"
330mm x 304mm x 190mm / 13" x 12" x 7.5"